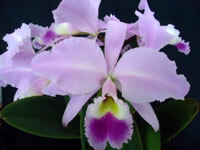 5 plants cultivated by members of ORCHIDS.ORG. Cattleya gaskelliana is an orchid species identified by (N.E.Br.) B.S.Williams in 1993. ORIGIN: Found at altitudes of 700 to 1000 meters in Colombia and Venezuela. DESCRIPTION: A medium sized, cool to warm growing epiphytic species with clavate, compressed, grooved pseudobulbs subtended by greyish sheaths nad carrying a single, apical, elliptic-ovate, thick, coriaceous leaf and blooms in the late spring and late summer on a terminal, 3 3/4 [9 cm] long, few, fragrant flowered inflorescence arising on a mature pseudobulb subtended by a large basal sheath. FLOWER SIZE: 5 inches [17.5 cm] -- information provided by Jay Pfahl, author of the Internet Orchid Species Encyclopedia (IOSPE).